Justice Potter Stewart. 92nd Associate Justice of the United States Supreme Court. Taken January 28, 1976. 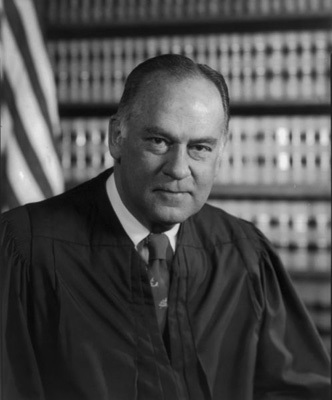 Potter Stewart was an Associate Justice of the United States Supreme Court. Stewart was born on January 23, 1915, in Cincinnati, Ohio. Stewart's father was an attorney and had served as Cincinnati's mayor. Stewart also became an attorney. He graduated from Yale University in 1937 with an undergraduate degree and in 1941 with a law degree. He practiced law briefly in New York City and enlisted in the United States Naval Reserve soon after the Japanese attack on Pearl Harbor in 1941. During World War II, Stewart served on tankers operating in the Atlantic Ocean and in the Mediterranean Sea. Following the war, Stewart returned to Cincinnati, where he practiced law and on the Cincinnati City Council. In 1954, President Dwight D. Eisenhower appointed Stewart to be a judge of the United States Court of Appeals for the Sixth Circuit. Four years later, Eisenhower appointed Stewart to be an associate justice on the United States Supreme Court. In his opinion in Griswold v. Connecticut, Stewart upheld a law banning the sale of contraceptives. He supported a women's right to an abortion in Roe v. Wade and linked property rights to people's personal rights in Lynch v. Household Finance. His best-known ruling while serving on the Supreme Court came in Jacobellis v. Ohio, a case about obscenity in movies. Stewart stated in his opinion, "I know it when I see it." In July 1981, Stewart retired from the Supreme Court. He later participated in several television documentary programs on the United States Constitution. Stewart died on December 7, 1985.